An electric motor is a device used to convert electrical energy to mechanical energy. Electric motors are extremely important in modern-day life. They are used in vacuum cleaners, dishwashers, computer printers, fax machines, video cassette recorders, machine tools, printing presses, automobiles, subway systems, sewage treatment plants, and water pumping stations, to mention only a few applications. the wire loop shown in the figure below. The presence of that current creates a magnetic field around the wire. Since the loop itself has become a magnet, one side of it will be attracted to the north (N) pole of the surrounding magnet and the other side will be attracted to the south (S) pole of the magnet. The loop will begin to rotate, as shown by the arrow marked F.
AC motors. What happens next depends on the kind of electric current used to run the motor, direct (DC) or alternating (AC) current. With AC current, the direction in which the current flows changes back and forth rapidly and at a regular rate. In the United States, the rate of change is 60 times per second, or 60 hertz (the unit of frequency). In an AC motor, then, the current flows first in one direction through the wire loop and then reverses itself about 1/60 second later. This change of direction means that the magnetic field produced around the loop also changes once every 1/60 second. At one instant, one part of the loop is attracted by the north pole of the magnet, and at the next instant, it is attracted by the south pole of the magnet. But this shifting of the magnetic field is necessary to keep the motor operating. When the current is flowing in one direction, the right hand side of the coil might become the south pole of the loop magnet. It would be repelled by the south pole of the outside magnet and attracted by the north pole of the outside magnet. The wire loop would be twisted around until the right side of the loop had completed half a revolution and was next to the north pole of the outside magnet. If nothing further happened, the loop would come to a stop, since two opposite magnetic poles—one from the outside magnet and one from the wire loop—would be adjacent to (located next to) each other. And unlike magnetic poles attract each other. But something further does happen. The current changes direction, and so does the magnetic field around the wire loop. The side of the loop that was previously attracted to the north pole is now attracted to the south pole, and vice versa. Therefore, the loop receives another "kick," twisting it around on its axis in response to the new forces of magnetic attraction and repulsion. Thus, as long as the current continues to change direction, the wire loop is forced to spin around on its axis. This spinning motion can be used to operate any one of the electrical appliances mentioned above. DC motors. When electric motors were first invented, AC current had not yet been discovered. So the earliest motors all operated on DC current, such as the current provided by a battery. A capacitor is a device for storing electrical energy. Capacitors are used in a wide variety of applications today. Engineers use large banks of capacitors, for example, to test the performance of an electrical circuit when struck by a bolt of lighting. The energy released by these large capacitors is similar to the lightning bolt. On another scale, a camera flash works by storing energy in a capacitor and then releasing it to cause a quick bright flash of light. On the smallest scale, capacitors are used in computer systems. A charged capacitor represents the number 1 and an uncharged capacitor a 0 in the binary number system used by computers. How a capacitor stores energy A capacitor consists of two electrical conductors that are not in contact. The conductors are usually separated by a layer of insulating material known as a dielectric. Since air is a dielectric, an additional insulating material may not have to be added to the capacitor. Think of a capacitor as consisting of two copper plates separated by 1 centimeter of air. Then imagine that electrical charge (that is, electrons) are pumped into one of the plates. That plate becomes negatively charged because of the excess number of electrons it contains. The negative charge on the first copper plate then induces (creates) a positive charge on the second plate. As electrons are added to the first plate, one might expect a current to flow from that plate to the second plate. But the presence of the dielectric prevents any flow of electrical current. Instead, as more electrons are added to the first plate, it accumulates more and more energy. Adding electrons increases energy because each electron added to the plate has to overcome repulsion from other electrons already there. The tenth electron added has to bring with it more energy to add to the plate than did the fifth electron. And the one-hundredth electron will have to bring with it even more energy. As a result, as long as current flows into the first plate, it stores up more and more electrical energy. Capacitors release the energy stored within them when the two plates are connected with each other. For example, just closing an electric switch between the two plates releases the energy stored in the first plate. That energy rushes through the circuit, providing a burst of energy. The primary difference between a DC motor and an AC motor is finding a way to change the direction of current flow. In direct current, electric current always moves in the same direction. That means that the wire loop in the motor will stop turning after the first half revolution. Because the current is always flowing in the same direction, the resulting magnetic field always points in the same direction. To solve this problem, the wire coming from the DC power source is attached to a metal ring cut in half, as shown in the figure. The ring is called a split-ring commutator. At the first moment the motor is turned on, current flows out of the battery, through the wire, and into one side of the commutator. The current then flows into the wire loop, producing a magnetic field. Once the loop begins to rotate, however, it carries the commutator with it. After a half turn, the ring reaches the empty space in the two halves and then moves on to the second half of the commutator. At that point, then, current begins to flow into the opposite side of the loop, producing the same effect achieved with AC current. Current flows backward through the loop, the magnetic field is reversed, and the loop continues to rotate. Alternating current (AC): Electric current in which the direction of flow changes back and forth rapidly and at a regular rate. Ampere's law: A law that states that a wire carrying an electric current produces a magnetic field around itself. Direct current (DC): Electric current in which the direction of flow is always the same. Frequency: The number of waves that pass a given point in a given period of time. 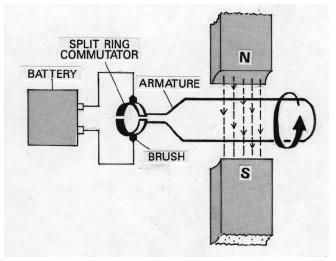 Split-ring commutator: A device that changes the direction of current flow in a DC motor. I need to applications of types of electric motors? Good to see I can still find out the basics on sites like these. good..... i had to complete my assignment about principle of electric motor..
and from this article,, it has been completed..!! Nice text as it enhances my knowledge on how electric motors works. This is very helpful for me since i am new in studying how electric Motors.How do i culculate the power out put of a motor. sir can you explain me about the electricity produced during the flux linked and that of bettery its confuse olsa on my experiment thanks. Thank you for giving examples!!! Yours was the only one I could find with examples on what the motor was used for! That is so important while writing a research paper! Thank you!